Nothing makes you realize you need a new tool in your kit like dealing with an overtightened or rusted bolt. 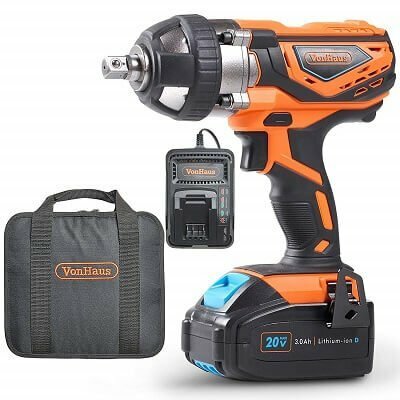 If you’re looking to flesh out your mechanic toolkit, need to replace your current impact wrench or just want to feel like a Nascar pit crew member then keep reading to find the best cordless impact wrench for your needs. It’s not easy to find the ideal cordless impact wrench. That is exactly why we’ve tried the top best cordless impact wrench brands on the market. If you need a powerful, versatile and durable impact wrench, then the DEWALT DCF899P1 20V MAX XR 1/2″ Impact Wrench will be the best fit for your needs. 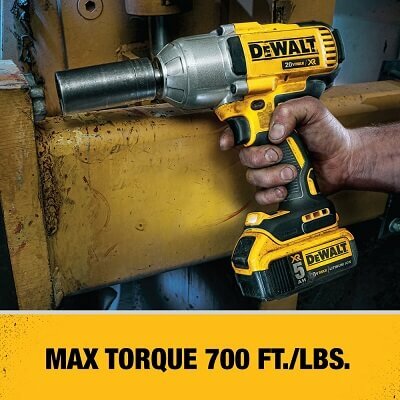 The DEWALT 20V MAX XR is another powerhouse of an impact wrench. It was uniquely designed for working in dark spaces and boasts superior comfort and speed control on this device. Many refer to this model as a torque monster because of how much ease it brings to seemingly impossible jobs. 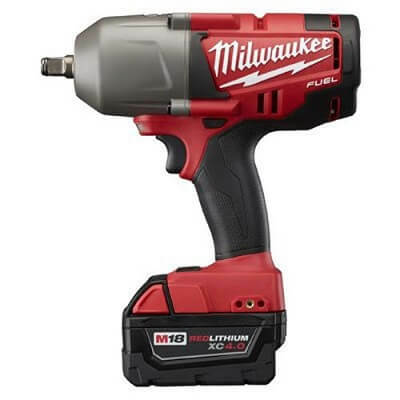 Like the Milwaukee 2763-22 M18, this impact wrench also has a max torque of 700 ft-lbs and slightly higher breakaway torque at 1200 ft-lbs. For its speed control, it has three options including 0-400, 1,200 and 1,900 RPM. It runs off of 20 volts and uses a detent anvil, making for especially secure retention. For those dark spaces, this impact wrench has an LED light to help your visibility. It has a compact design at a length of 8-13/16” and weighs in at 7.2 lbs. This product comes with 1 Lithium-ion battery, as well as a bag, charger and the bare device. It also has a 3-year limited warranty. Be mindful that it comes with California’s Proposition 65 warning for potentially harmful materials. This tool is perfect for your tough jobs. Rusted bolts, suspension bolts and garage door installations are off in the blink of an eye. This impact wrench may be a little overkill if your main purpose is to remove lug nuts (unless they’re the lug nuts of an international dump truck), but it may be your go-to for big jobs. However, although a detent pin system is a secure retention method, some people are not a fan of this system because it requires a nail or punch to change the socket, which can make it a pain at times. This tool claims to be the most powerful cordless impact wrench in its class with 2X more runtime and more work per charge than any other battery using the REDLITHIUM XC5.0 Extended Capacity Battery Pack. In terms of torque, this impact wrench has two modes with Mode 1 featuring 100 ft-lbs and Mode 2 featuring 700 ft-lbs for fastening. Its breakaway torque comes in at a whopping 1100 ft-lbs for your nut-busting needs. All of this runs off of a voltage of 18V and uses the M18 battery system. It has a ½ inch Anvil with friction ring for quick and simple socket changes. This impact wrench features a brushless motor, which runs cooler than most because it has no wearable components. It is made from metal, runs off of 2 lithium-ion batteries and is very lightweight. In the package, you will find two 5.0 batteries along with the bare tool and a charger. This product has extreme power and is very handy to use for long periods of time with a quick charge and long battery life. It is lightweight with no twist or kickback and comes with a 5-year limited warranty. However, the modes can be difficult to switch between with gloves on. 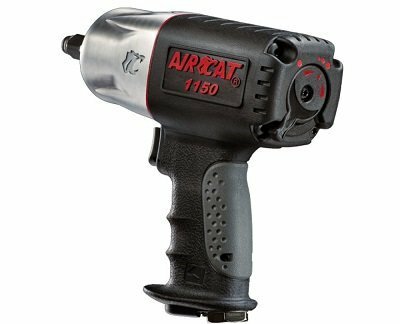 This high-torque impact wrench was designed for the vehicle repair industry and is able to handle some of the harshest industrial environments. Uniquely, this model offers multiple retention methods, making it especially versatile. 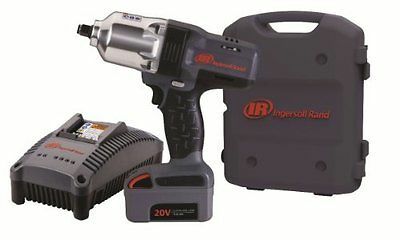 The Ingersoll Rand W7150 has 780 ft-lb max torque and 1,000 ft-lb nut-busting torque. It also has a patented soft-mount system which reduces vibration and helps to extend the motor life. In addition, it has been ergonomically designed to help reduce operator fatigue so you can keep working all day. This model features an all-metal drivetrain and a steel-lined aluminum hammer case, making it strong and powerful, yet still lightweight weighing in a 6.8 lbs for both tool and battery. Its housing has been designed to protect against repeated drops and exposure to shop liquids as well. In the base kit, you will find the bare tool along with a 20V lithium-ion battery 3.0 Ah, charger and a blow-molded case. The wrench is made in China, and the batteries are manufactured in Poland. This tool offers one of the best power-to-weight ratios in its class. It has been rigorously tested for reliability and has been optimized for use in industries such as heavy trucks, fleet maintenance, rail, heavy machinery, and construction. You may no longer need air tools by owning this model. However, it is a pretty big tool that may have trouble squeezing into tight areas due to its size. This next model is a bit more tame. The VonHaus 20V has a tightening torque of 260 ft-lbs and a nut busting torque of 300 ft-lbs. These numbers may seem small compared to the 700 ft-lbs and 1000 ft-lbs ranges of the previous models, but remember that most lug nuts are only torqued to 100 ft-lbs, so this still packs a significant punch. This impact wrench has a variable speed trigger, meaning the speed of the wrench changes with the amount of pressure you apply to the trigger. It also features an easy forward/reverse button to allow for quick change of the rotational direction. A cast aluminum gear head makes this impact wrench strong, lightweight and durable. It also features a convenient belt hook and an easy-to-handle weight of 5.5 lbs. This tool comes with a 20V Max Lithium-ion D series 3.0 Ah battery that has a rapid charge of only 75 minutes. The battery has no memory effect, which helps it to resist self-discharge during storage. This means it’s ready to go the next time you use it rather than needed to charge it up again first. Also included are the battery charger, bare tool and tool bag. If you are looking for a budget-friendly option and are not a professional mechanic, this may be a great option. Don’t be too concerned that it’s a lesser known brand as the results may pleasantly surprise you. However, if you have a heavy duty job to tackle, this may not have enough power for you. If you need an impact wrench that’s lightweight and easy to fit in tight spaces, this is the option for you. At 3/8” it is a much smaller tool overall than the ½” versions. This may come in handy for the majority of your home project needs. This model also features 3 LED lights with a 20-second delay to allow you to see in any dark or shadowy areas. It has a hog ring anvil to allow for easy socket changes and a textured grip to prevent slips and provide comfort and control. Speaking of comfort and control, at 5.70” front to back length and a lightweight body of 3.4 lbs, this impact wrench is the most compact by far. It is made from ABS thermoplastic, which is resistant to chemicals, heat, and impact. This version only includes the bare tool. The batteries and charger will need to be purchased separately. If you own other DEWALT 20V batteries, they will be compatible with this product. It does have a 3-year limited warranty by the seller. This impact wrench is excellent for projects all over the house, as well as removing lug nuts. However, you may not have enough power with this model to remove an especially stubborn or rusted lug. If you already have a ½” version, you may find yourself using this as your go-to for most projects because of its ease and convenience of use. 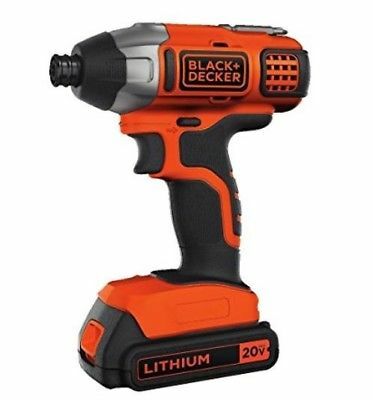 The BLACK+DECKER 20V MAX Impact driver is another excellent option for a budget-friendly compact and lightweight impact wrench. At well under $100, it delivers outstanding power for your small project needs. However, the amount of torque it delivers for its size may surprise you. Though small, this high-performance transmission has 1375 in-lbs max torque. It also has a quick release ¼” hex bit change. This unit has variable speeds, operates at 0-3000 rpm and 0-39000 BPM. This impact wrench has a metal body, yet weighs in at only 3.5 lbs. In this kit, you will find the bare tool, a 20V Max Battery, battery charger and screwdriving bit. It is also backed by a 2-year limited warranty if there are any defects in the material and/or workmanship of your new item. If you are looking for an impact wrench to hammer in screws, extract bolts, put up fences or other around the house projects, this product is a winner. Its price and ease of use make it a solid option for consideration if your main goal is light work. It will not, however, break loose lug nuts or more powerful jobs. This impact wrench claims to be the most powerful ½” impact in its class. It has 1295 ft-lbs of loosening torque and a maximum torque of 900 ft-lbs. It has a twin hammer mechanism that allows for 1,400 blows per minute, making it the strongest hard hitting twin hammer on the market for the ½” impact wrench category. What’s unique about this model is its patented quiet tuned exhaust, which is 86 decibels. It is also well thought out when it comes to usability. It has patented both its ergonomic handle design and its easy flip lever operation system to switch from forward to reverse. The body is made of a composite material with aluminum finish. This means it is especially lightweight at 4.63 lbs and 7.5” in height, which is quite compact for a ½” impact wrench. Rather than a battery pack, this model is corded-electric. Since this model does not require a battery pack, none is included in the kit purchased like with many of the other models. It does come with a 2-year part and labor warranty. This impact wrench is great for small to medium level jobs. If the noise level of most impact wrenches bothers you, this is the model to look out for. However, it may have trouble with larger jobs, and some owners are unhappy with the amount of vibration this impact wrench and potential socket wobble as the gun comes up to speed. What Is the Best Cordless Impact Wrench to Buy? 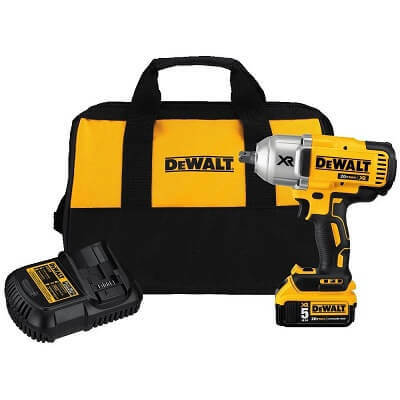 The most highly recommended impact wrench of these listed is the DEWALT DCF899P1. It will take care of the widest variety of situations in which you may find yourself. This impact wrench has enough power to handle professional level problems, but it also not overkill for use in projects around the house. This way, it won’t be such a pain that you don’t want to get it out and use it, but you will also not come across a situation where you need more power. Its three-speed controls will help to accommodate a variety of situations and help fulfill all of your project needs. 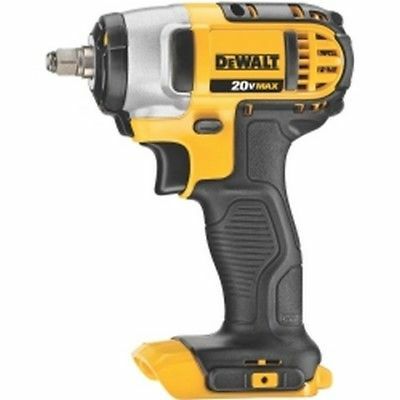 If you buy the smaller DEWALT DCF883B instead because you want the great brand but want to save a little cash, you may soon find yourself back at the store after it is unable to tackle a rusty bolt or too tight lug. What Are Impact Wrenches Used For? Impact wrenches are most commonly used for loosening lug nuts on cars and trucks. However, they can be used in a variety of high torque situations such as mounting or hanging something heavy or removing machine-tightened nuts and bolts. Impact wrenches can also be used in place of any situation where you would use a traditional hand wrench. One may come in handy if you have a large volume of things to tighten or loosen by saving you time. What Size Air Compressor Do I Need for Impact Tools? For cordless impact wrenches, no air compressor is necessary. They are able to achieve their massive amount of torque through battery power. Can You Use an Impact Driver as a Wrench? Both impact drivers and impact wrenches function similarly, using concussive blows to the driver to create torque rather than spinning as a power drill does. However, impact wrenches are much more powerful. Impact wrenches are made for the real heavy duty jobs and are often overkill for projects around the house unless used on a low setting. They are built for use on huge machinery and Nascar race tracks, though they are also very convenient to use on projects and mechanic work in your own driveway. While adaptors do exist to convert the usual ¼” hex drive of an impact driver into the standard ½” square drive of an impact wrench, it will still not have the power to handle the big jobs. This method can definitely be used for small projects where you would traditionally use a hand wrench. Can You Use Regular Sockets with an Impact Wrench? Regular sockets are not recommended for use in an impact wrench. They are both made from similar steel but differ in terms of wall thickness and material hardness. Regular sockets are likely to fail catastrophically. The most significant factor is the safety of the user. Besides that, it would also cause unwanted wear on your cordless impact wrench. We recommend avoiding the potential flying shrapnel and using sockets made for impact wrenches. Stay safe and use traditional impact wrench sockets. Using an impact wrench as a drill is possible, but not recommended. It is possible to adapt a ½” drive into a 7/16” hex drive, but you will not have the same precision as with a standard drill. It could possibly come in handy to bore holes if a lot are needed on a project, but don’t expect the same level of control for normal drilling needs. The exception to this is if you are buying a lower power impact wrench. Some models intended for small projects and home use are designed and built with traditional drilling in mind. Some even come with a drill bit included as part of the kit to purchase. Also, it is still recommended to use only impact grade attachments because of the strong possibility of breaking a non-impact tool grade attachment. For your safety, only use an impact wrench for its intended tasks. Think about the typical situations you may need this impact wrench in your life. If you work with heavy machinery or are a professional mechanic, you will need more power. Also, if you intend to use it around the house, but will likely have a couple of big jobs, make sure you get the power to handle those situations. You will want to avoid the frustration of buying based on your general use only to find you will need to buy a new, stronger tool when those bigger situations come up. On the other hand, if your sole use is for home projects, you can get away with less power. These would mostly be situations where a hand wrench would be possible, but less convenient to use. How will you store your impact wrench? Some are well protected with hard, molded cases, while others come with only a bag or sometimes just the bare tool. Damage to the tool due to lack of protection is often not covered in the tool’s limited warranty. Check what comes with each kit to know if you will need to make an additional purchase of buying a storage case for it as well. Also, where will you store this in your home? This is a factor to consider to protect your new tool from possible environmental elements. Size and weight are important factors to consider. If the majority of your jobs will be in tight dark places, you will want to look for a model that will accommodate this. Some mechanics will find themselves going back to purchase a smaller model after realizing how uncomfortable it is to use a heavier model for hours on end. This is a factor to consider if your purpose is home projects as well because the usability of your impact wrench will determine how often you will want to use it. Without an air hose, the life of your project depends on your battery life. Extra batteries may be a solution, or if you own other tools, you may be able to buy an impact wrench of the same brand to be able to share batteries of the same size. Some models are better at conserving battery power when not in use, making it possible to pick up and go when starting your next project rather than waiting for batteries to charge first. This is considered the battery’s memory. This extra effort can make it well worth it to ditch the air hose of traditional impact wrenches. Impact wrenches vary greatly in price. Generally, the higher you go in power, the more you will pay. However, don’t scrimp on price just to find yourself needing to go back and buy a second tool because you didn’t buy enough power the first time. Consider your projects to find this happy medium. If your to-do list is solely home projects, you may be able to come out under the $100 price range. Consider this purchase an investment. A more powerful impact wrench, used properly, can be used for many, many years. The price over the course of its lifespan, when considered in this way, is often well worth a higher purchase. I hope you found our Best Cordless Impact Wrench article useful. 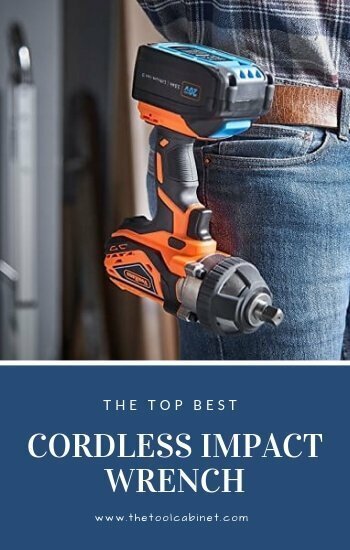 Do you have any other questions about any other Cordless Impact Wrench brand?